Very nice photo. Where was it taken? I wouldn’t say no to an all day breakfast right now. It’s got to beat IHOP, that’s for sure. I love orange crush. Great contribution! I feel as though I just climbed into a time machine. Places that serve breakfast all day usually have the best breakfasts in town! Especially little hole in the wall places like this one! Great picture! This photo may as well have been taken in the 1960s. Nothing about it says it was taken before, oh, 1965 or so (well, maybe the faded sign is telling, but still). What a cool picture! Thanks for sharing. Happy WW. 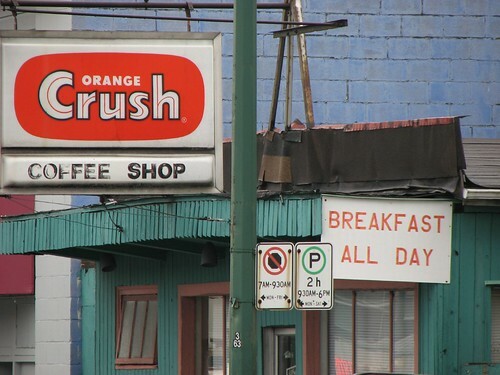 Think I’ll pass on the Orange Crush Coffee. Great picture! If you have time, please check out my pic on My Photo Blog. This picture makes me “hungry” for more of your photos! I love shots like this. Keep them coming. I can’t remember the last time I saw an Orange Crush in the grocery store. Do they still make it? Neat photo..I loved Orange Crush! Well, breakfast, crush soda and coffee . .. sounds good to me!